Custom CNC (computer numerical control) plasma cutting is available.We have hundreds of stock designs from which you can choose, some are even cut out and available for purchase. Our team is also available to help bring your unique images to life. Just bring us a clean, black and white, image to scan and we should be able to help you. We take pride in our plasma cut products, which are reflected in an a clean and precise end product. 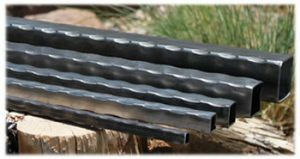 We have a number of different twisted steel ideas for you to include in your projects. We twist an assortment of tubing and flat bar to achieve a unique element that you can use to customize your project. We hammer our own square and rectangular tubing in-house. These custom pieces of steel can bring a decorative element to any project. We have many sizes available and in different thicknesses, as well. 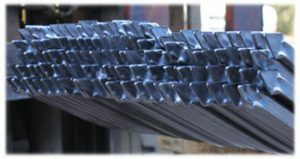 We sell pre-cut pickets and will also do custom cutting on our tubing, angles, solids, flat bar, channel, rebar, etc. 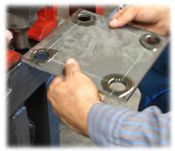 We can also cut to size, mild steel sheets and plate goods up to 3/8" thick. We punch channel, angle, flat bar, base plates, and more. Punching is considered to be the most cost effective way of creating holes into steel. We operate a variety of punch sizes to assist our customers needs. Pressed and bent pickets spears offer a unique and cost effective way of using steel for perimeter fencing. They also provide a safe and secure way to protect your property. These pickets are available by the piece or as panels with 16 Gauge 1/2", 5/8", 3/4", or 1" material. Just let us know how long you need the pickets to be and we would be happy to accommodate your request. We custom bend tubing and flat bar. We make custom arches and our own custom rings. Should you choose to pick up your order, we can make cuts for a minimal fee. We load your vehicle, and you are responsible for securing the load.